On Monday the 11th September 1933 "Bubbles" went missing from St. Erth station. Bubbles was the St.Erth Station cat who was blameless, kept good hours and was attentive to his duties. Kidnapping was suspected. When last seen Bubbles was wearing a ribbon with the words GWR, ST.ERTH. Was Bubbles as assiduous as this in the performance of his duties on the GWR? 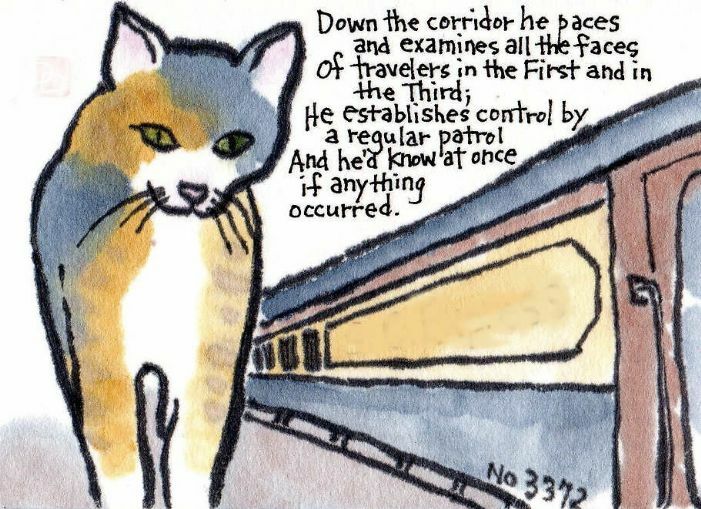 That evening the cat returned to the station on a train from Paddington which arrived at 9.20pm. Unlike Skimbleshanks, frequenter of the luggage van, Bubbles spent the return journey in the dining car, travelling in style. Normally a cat of irreproachable morals and character, Bubbles offered no explanation for his absence and his employers chose not to enquire too closely. History, it seems, repeats itself. In January 2017 a dishevelled cat was rescued from the undercarriage of a High Speed Train at Penzance. Unlike Bubbles, Polly had not travelled in style or comfort but her journey had taken her from Plymouth to Paddington, Paddington to south Wales and back to Paddington and finally from Paddington to Penzance. It's thought she boarded the train while it was being serviced in Plymouth as she managed to stow away in an area not normally accessible. Polly's cries were eventually heard by the train manager, Emily Mahoney-Smith, as the train passed Plymouth but Polly was not located until St Germans where Ms Mahoney-Smith and the driver both got out to investigate. The bedraggled Polly was very much the worse for wear with an open fracture on her front left leg but it seems she was still able to enjoy the contents of tuna sandwich from the buffet car. On arrival in Penzance Polly went off for some medical attention at Rosevean Vets where Matthew Berriman confirmed that she must have been on the train for several days as her fracture was at least four days old. Fortunately for Polly, she'd been micro-chipped and it was only this that saved her from being put down. The chip enabled the rest of Polly's story to be put together and it seemed that she had disappeared from her owners, Mr and Mrs Westingham, who live near the Plymouth railway yard at Laira. She'd been gone for three weeks and GWR calculated that she must have travelled 1667 miles without a ticket. The cat's owner, Mrs Louisa Westington said, on hearing the news, “Well, she's certainly seen more of the country than I ever have. After a period of recovery at Rosevean, following a paw amputation, Polly was reunited with the Westingtons. Arthur Westington is a retired train driver!